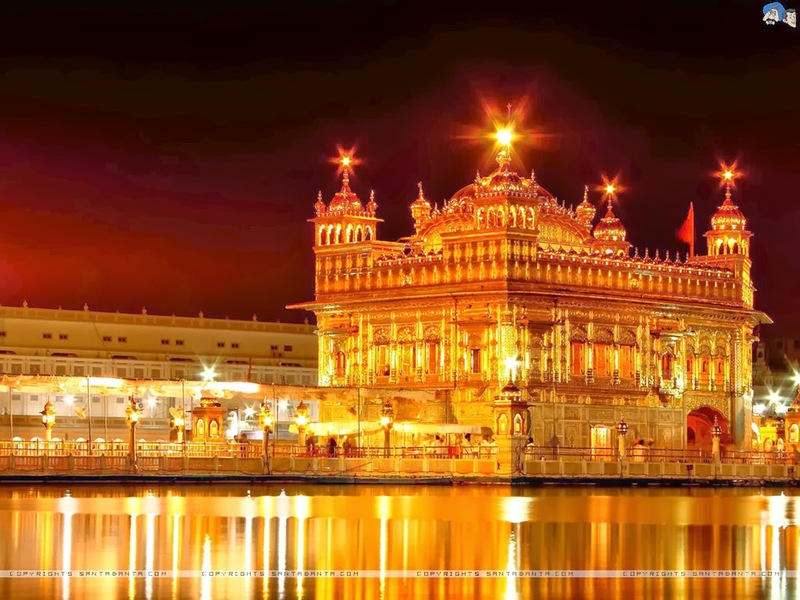 The Golden Temple is situated in Amritsar, located in Northern Punjab, India, which is close to the border of Pakistan. It is the central gurdwara, or worship place, for all Sikhs in the world. Its proper name is Harmandir, which means "Temple of God" and is resepctfully referred to as Darbar (meaning "court") Sahib (meaning" Lord"). Darbar Harmandir Sahib is known as the Golden Temple because of its unique features. The gurdwara is constructed of white marble overlaid with gold leaf and stands in the center of a sarovar, or pool of fresh, clear, reflective water which is fed by the Ganges River. Pilgrims bathe and perform ablution in the sacred waters of the tank which is known for its healing properties. The golden gurdwara has four entrances, one on each side, which are a symbolic welcome to all persons regardless of caste, class, color, or creed. A bridge extends from the gurdwara to the Akal Takhat, the governing body of religious authority for Sikhs.